ICPI launches a brand new, redesigned website with new features and content. Interlocking Concrete Pavement institute is pleased to announce our brand new, redesigned website. The newly designed website resulted from understanding the need to get to our members and the general public. Technical resources are now easier to access as well as more visually appealing. The new website focuses on the user, making it easier and more convenient to find the information you need. Contractors, Designers, and homeowners are now able to access specific information they need by clicking on their designated portal. The new website also brings a redesigned Members Only page, providing meeting information, member news and updates, as well as a member-dash board, where members can update their company information. The site includes a new search-by-proximity function now enables users to quickly find resources and services providers closest to their location. The new search function allows the user to search by contractor, certified installers, suppliers, distributors and manufactures by either state or zip code. In addition to finding a professional service, a new feature the website brings is the “Request a Quote” option. 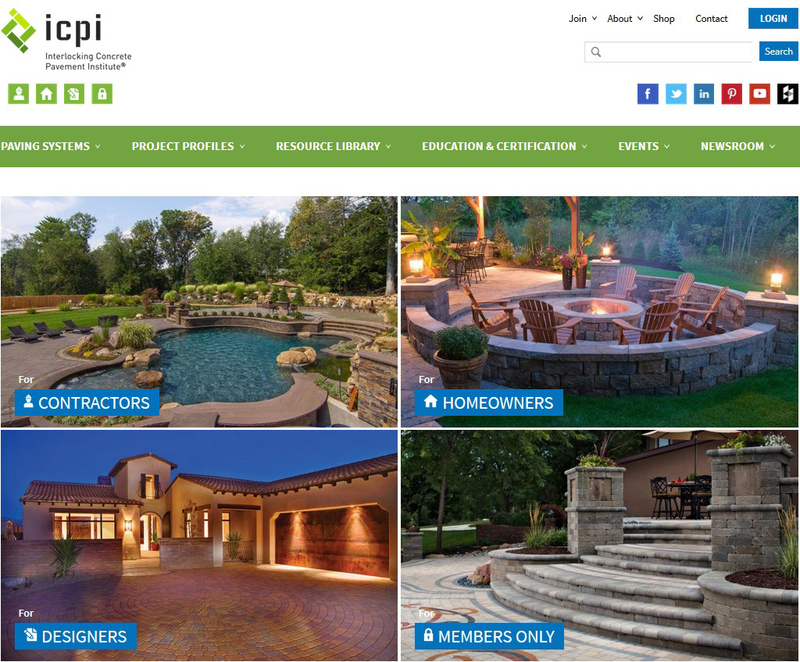 Request a Quote lets the user to find a minimum of 3 contractors in their area to receive a quote for their hardscape project directly from the ICPI website. Another new feature of the website is Project Profiles section. Become inspired by other company hardscape projects by browsing through commercial or residential designs. Many of the project profiles are winners from the HNA Awards. Members now can submit their very own projects to be promoted on the ICPI website for all to see. This tool is designed to help promote your business and gaining some exposure in the industry. Finally, our event page has been redesigned and updated. There is new Calendar of Events listing all of the upcoming ICPI courses and meetings. Sort by courses, certifications, meetings and webinars. There is an “add to calendar” button for you to keep track of what you are attending. Please enjoy exploring our new website and the features designed just for you. Please check and make sure that your company information is listed correctly. If you need to make any changes, please contact ICPI at icpi(at)icpi.org or call 703-657-6900. The Interlocking Concrete Pavement Institute (ICPI) represents producers, suppliers, contractors, design professionals and consultants and supports its members to advance segmental concrete pavement systems as the preferred choice for sustainable and environmentally friendly pavements in North America. ICPI aims to increase awareness, acceptance and use of segmental concrete pavement systems in North America through the development of marketing and technical resources for design professionals, contractors and homeowners. To learn more about ICPI, visit http://www.icpi.org.